Lung cancers that grow into the chest wall and rare primary tumors of the chest wall need to be removed or resected. With modern prosthetics and meticulous surgical techniques, chest wall tumors can be removed from patients with good functional and cosmetic outcomes. Some of the chest wall surgery therapies can be performed in part using minimally invasive techniques such as video-assisted thoracic surgery or VATS. Our thoracic surgeons provide surgical treatment and staging for lung cancer, pulmonary nodules, pleural effusions (abnormal fluid around the lung), lung infections (empyema), recurrent popping of the lung (pneumothorax), giant emphysematous bulla or “vanishing lung syndrome” and other diseases of the lung, as well as lung preserving surgery or “sleeve lobectomy” for tumors of the distal airway or bronchi (“wind pipes”). We have extensive experience in minimally invasive or video-assisted thoracic surgery (VATS). VATS can be performed to remove early stage lung cancers, drain effusions, and treat pleural infections, amongst other indications. Traditional thoracoscopic surgery requires a rather large access incision through the chest wall, with robotic access the incision is typically about half the size of a regular thoracotomy. Robotic surgery, with its wristed instrumentation and better visualization, allows dissection of the vessels and lymph nodes without such a large incision. The robotic system is simply a specialized surgical tool that allows the surgeon better visualization and improved fine motor control. These benefits are especially important in lung cancer surgery where dissecting around the heart and the great vessels require maximal dexterity. A robotic lobectomy does not mean a robot removes the lobe. The primary surgeon controls the procedure through a robotic device. The surgeon sits at a sophisticated electronic console, views the procedure through a special three-dimensional video image, and controls the action of robotic arms and instruments with both hands and feet. The robot assists or augments the movements of the surgeon. It makes no decisions, performs no movements of its own, nor is it programmed to perform the procedure. Mediastinal surgery includes several different types of procedures, which are used to biopsy or remove abnormal growths that form in the area that separates the lungs in the middle of your chest. This area, called the mediastinum, is surrounded by the breastbone in front, the spine in back, and the lungs on each side. 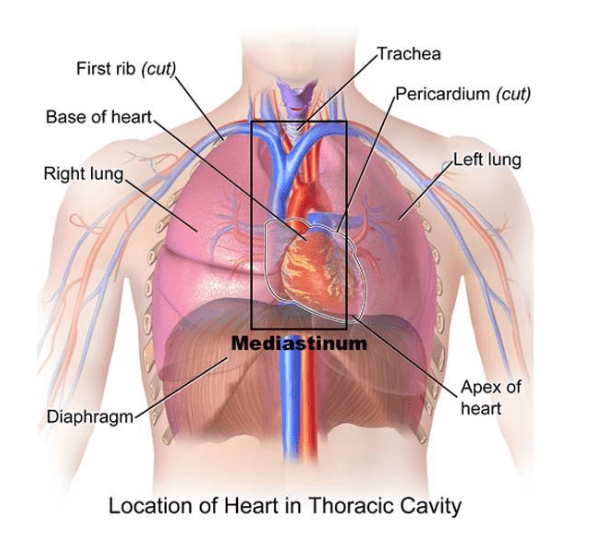 The mediastinum contains the heart, aorta, esophagus, thymus and trachea. Why is Mediastinal Surgery Needed? Due to their location in the mediastinum, mediastinal tumors (both benign and malignant) that are left untreated can cause serious complications, including invading the heart, pericardium (the lining around the heart), and great vessels (the aorta and vena cava.) Tumors located in the posterior (back) mediastinum can cause compression of the spinal cord. A thorough evaluation and diagnosis of each mass are necessary for the best surgical outcome.